Dove, come da un muoversi dell'ombra, Pareva salisse la forma. As I have said before, it is very difficult for an Italian artist to slip away from seductions of Beauty. This has, in many cases prevented Italian art to assume an active role in the rough dialectic of Modern Art. Of course there were exceptions: the Futurists at their best moment, before they died young orjoined la Metafisica. 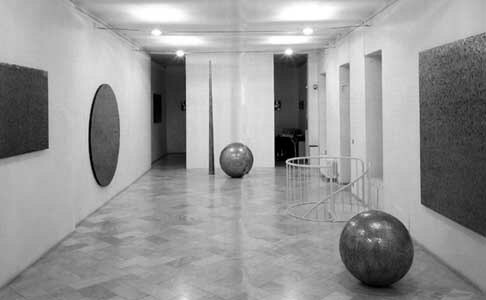 There were Fontana, Burri, Vedova - later Arte Povera. But even Fontana's great Tagli, meant to be dramatic and iconoclastic, are also very beautiful; there is a strange, aesthetic control in these paintings that eventually gives them the fine crispness of ceramics. Thus the ochre and red in some of Mainolfi's early landscapes in terracotta recall the vibrant, energetic colours of Giuseppe Pellizza's famous Fiumana; and some of the strange shapes (between village and mountain and tree) located on high, terracotta pedestals are, in their design, as refined as a Morandi still-life. And why not? Art aspires to be universal; but the reality of the artist are his local surroundings. There is an intimacy of place and profound knowledge which, somehow, have to be at the centre of an artists imagination. Imagination starts which real things: thing observed, things remembered, things borrowed. In a certain sense all art is a form of dialect, - at the beginning at least. Later the pure quality of the artist's intelligence and craft may give the local or personal anecdote a greater and wider significance and relevance. The poet Patrick Kavanagh wrote a poem about a quarrel between two Irish families. It happened in 1939, the year of the Munich bother - and Kavanagh asked himself whether that was not a much more important, momentous event. So the works of Luigi Mainolfi carry the detailed characteristics of a very personal imagination. What do all those curious shapes and forms signify? I do not know unless he tells me. But I see certain details that I recognise: trees, plants, buildings, fruits, shells or things like them. A pyramid covered with small signs of windows like the Tower of Babel. The works are like fairy-tales, I said, and therefore we could interpret or see this works as stories and anecdotes from strange, exciting, far-away places that exist in dreams, like Calvino's Invisible Cities. Only, now we see them, in all their local beauty that I find hard to resist.